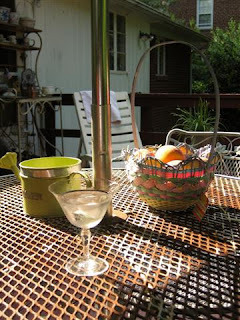 The afternoon sun, a cold martini with the condensation sweating down the outside of its glass, and a bite of a new season's peach - that's the way life should be (and was yesterday out on the veranda at Chez Cizauskas). Yes, the glass wasn't a cocktail glass. (I'll head out to the store to purchase one this weekend.) And yes, there was an ice cube or two floating in the beverage. But boy, oh boy, that looked good and tasted good. It was a martini: that means gin and a touch of dry vermouth. Any other use of the word is either redundant or redolent of apostasy. An apple isn't a Cadillac, and a Miller Lite isn't a "true genuine pilsner", and vodka or whatever isn't a martini. Gin is. It's 2 ounces of Boodles gin (just aromatic enough but without the botanical rain forest character of some newer gins) to a quarter or half-ounce of dry vermouth, then garnished with an olive and finished with just a dab of olive juice. Stir, and serve very chilled. The martini as a harbinger of spring. Moules au Frites, oh boy!